Premium and luxury are words that are directly associated with gold, so when a developer decides to name a residential project XXII Carat, it more than indicates what’s on offer. The 22 luxury villas on the West Crescent of the Palm Jumeirah are all furnished with high-end finishing materials and equipment imported from France and Italy, such as La Cornue, Baldi, La Cuisine Française, Devon & Devon, Schuco and Miele. XXII Carat is built on a 500,000-sq-ft plot and in three rows named Sapphire, which as eight villas and faces the beach, Emarald, which also has eight villas and faces the sea and Dubai Marina, and Ruby, which lies between the two rows with six villas. “The project has been conceived in a way to provide easy access to all residents to the beach,” says Yachmenev. “Sapphire, the most premium villas, has direct access to the beach.” The villas are being delivered at a time when the standards of luxury living in Dubai have changed, but for the better, according to Yachmenev. “A decade ago, Dubai was not a place to buy a home and settle down,” he says. “It was transient and short term and wasn’t taken seriously as somewhere you might want to spend the next 20 to 30 years of your life. Residents also enjoy valet parking and concierge services, pool and garden maintenance and even chauffeuring kids. First glimpse : when you step inside the villa, the first thing you notice is the kitchen. The timeless beauty of La Cornue cookers, which are decorated with fleur-de-lis and one-of-a-kind enamelled plinths, is a clear standout feature. These custom-made range cookers combine traditional style with the latest technology to ensure outstanding cooking results. Complimenting the cookers are the kitchen cabinets, which were fitted by leading French company La Cuisine Française. “The kitchen is technically the most challenging part of the house – an everyday work area with its mixture of humidity, heat, liquids and air circulating in and out,” explains Christopher Cousin, founder and CEO of La Cuisine Française, whose family has been creating, manufacturing and fitting luxury furniture since 1821. “Most of our kitchen cabinets are made from plywood carcasses, guaranteeing stability and lightness in weight, resistance to humidity, and increased load capacity. But for XXII Carat we went a step further by upgrading certain features and adding special flourishes such as the addition of fine gold and silver leaf.” The bathroom is where you will find the jewel in the crown of the XXII Carat villas: the $1-million (Dh3.67 million) bathtubs, which feature precious-rock fixtures from high-end Italian interiors specialists, Baldi. Taking inspiration from the Italian Renaissance, Luca Baldi, CEO of the family-owned company, describes his creations as “a perfect expression of the rarity and exclusivity of the Italian lifestyle”. The raw crystals, weighing in at more than 10,000kg each, were shipped from Brazil to Italy, where they were then hand-carved into a deep egg shape before arriving in Dubai. Italian firm Devon & Devon provided the decadent bathroom décor, giving it a touch of European elegance. Art director Paola Tanini, and in partnership with the interior design studio Transforma, picked out catalogue pieces that were painstakingly redesigned and adapted to the Arab-Mediterranean style. “We take classical shapes and use contemporary materials to come up with astonishing timeless bathroom furnishings,” says Tanini. 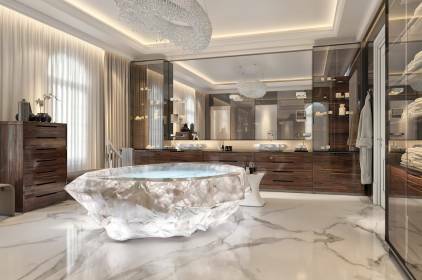 “For XXII Carat’s bathrooms we used the Rose collection, Dandy and Coventry taps and fittings in an 18-carat gold finish and Cavendish accessories.” The properties in the development are priced between Dh3,500 and Dh7,500 per square foot. For the smaller Ruby villas, the starting price is around Dh39 million. Prices go all the way to Dh92 million for the only remaining corner unit in Sapphire. The developer says half of the properties are already sold. “When we started work, it was the last piece of land on the crescent,” says Yachmenev. “Hence, we were able to incorporate the most modern design structure and add in some of the latest technological advancements into the development.” The development has a built-up area of about 300,000 sq ft, which includes the villas and a hotel apartment located at the centre of the development, which also houses the concierge service. Each villa has a minimum plot size of 15,000 sq feet and up to 26,000 sq feet for corner villas, with built-up areas ranging from 10,000-12,000 sq ft. The developer said it has a land bank to build two more projects in new and upcoming areas in Dubai. “In terms of buildable area, we have about 700,000 sq ft and about 450,000 sq feet of sellable area,” Yachmenev.